Let your young child explore, play and create with the all-new LEGO® DUPLO® Toddler Starter Building Set! Extra-large DUPLO bricks are the perfect introduction to creative building for toddlers. This 37-piece set includes patterned and eye-decorated DUPLO bricks that are fully compatible with standard DUPLO bricks and elements. The box lid also doubles as a building plate. The toddler sets are aimed for ages 1.5 – 3 years of age. Braden’s just turning 3 in a couple of weeks but he still loved them just the same. 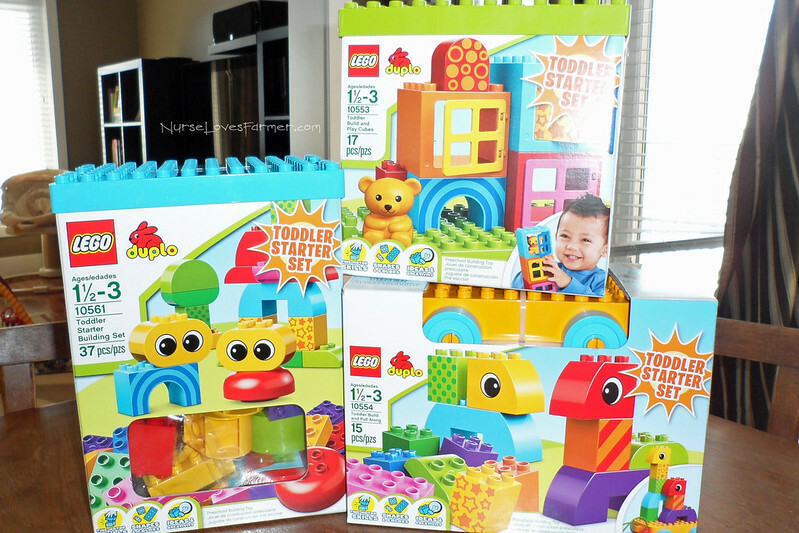 I can see why they would be more appealing to toddler eyes – the bricks are very bright and colorful, the animals have big, bright eyes and I especially love the pull along set – I know Ethan will love this toy in a year or so! One of the awesome things about having mommy friends is that we got to have our party on a Tuesday afternoon! We had an absolutely full house 10 kids and 3 babies! 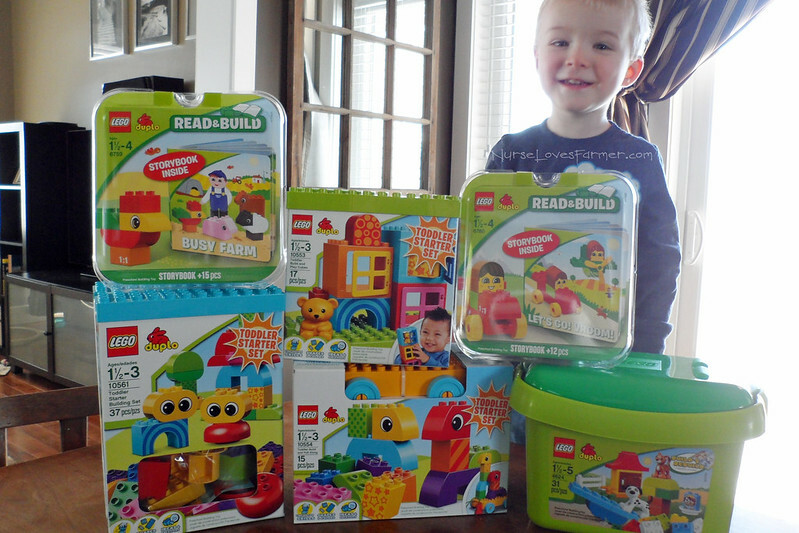 The kids all had an awesome time playing with the new Toddler Line LEGO DUPLOs. I found that the designs were easier for the kids to follow along and build. 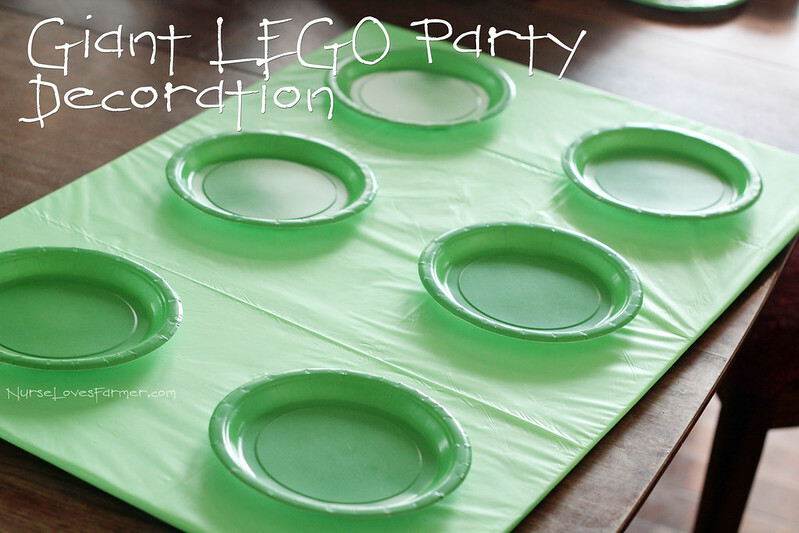 I enjoyed this LEGO themed party and made LEGO cheese and crackers! More on the party side of things, I did some really easy DIY part decorations that I’d love to share with you! If the non-crafty mommy in me can do them…you can too! This is really easy to do! 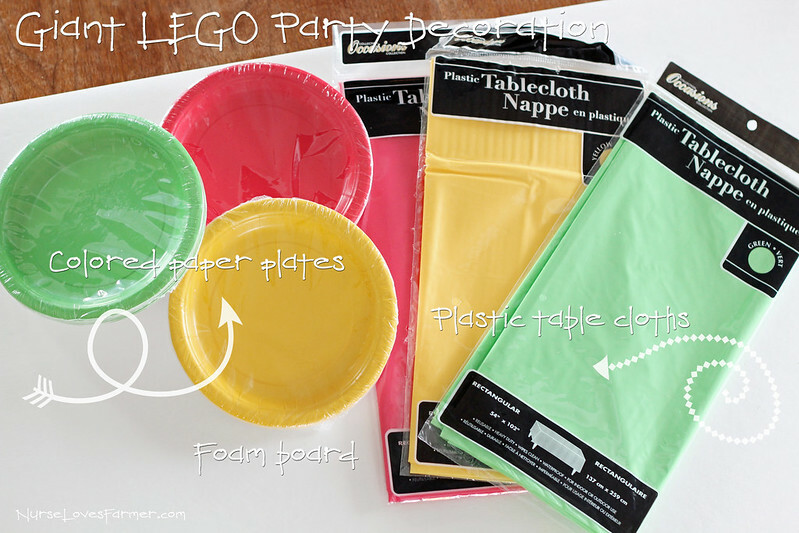 All you need is foam board, paper plates, and plastic table cloths. I’m sure they would look just as nice with big construction paper or colored poster board too! But, I was pretty impressed with myself that I thought of this idea on a whim AT the dollar store. That’s another bonus, this project cost all of $3 per piece to make and I had leftover plates after! 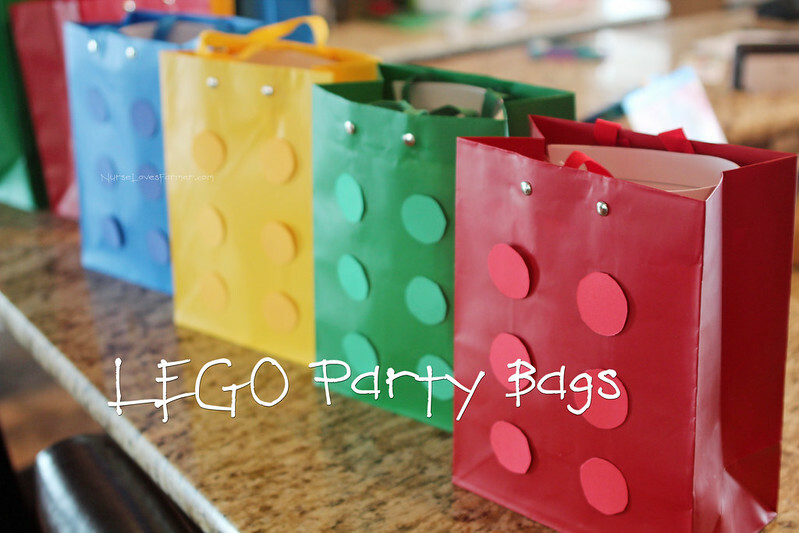 I also bought gift bags in LEGO colors, cut out circles from scrapbook paper I had, and made my own LEGO gift bags for the kids to take some goodies home! 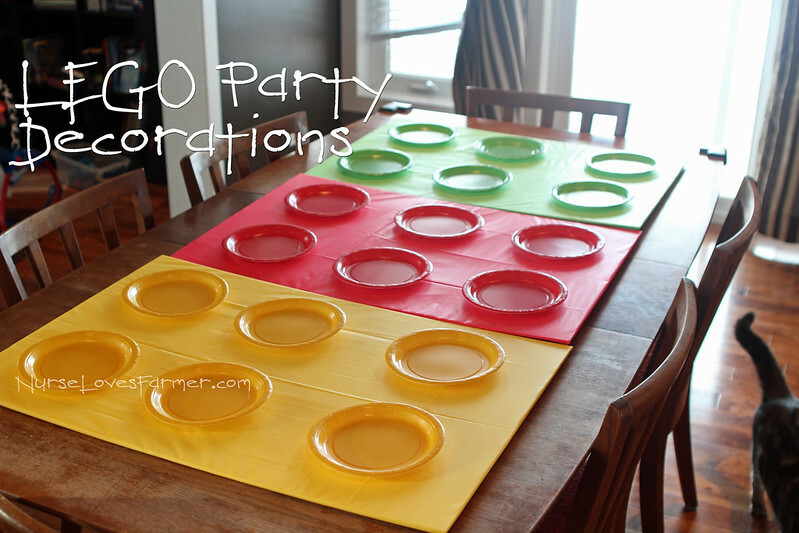 LEGO parties are super fun and the decor is very easy to DIY. 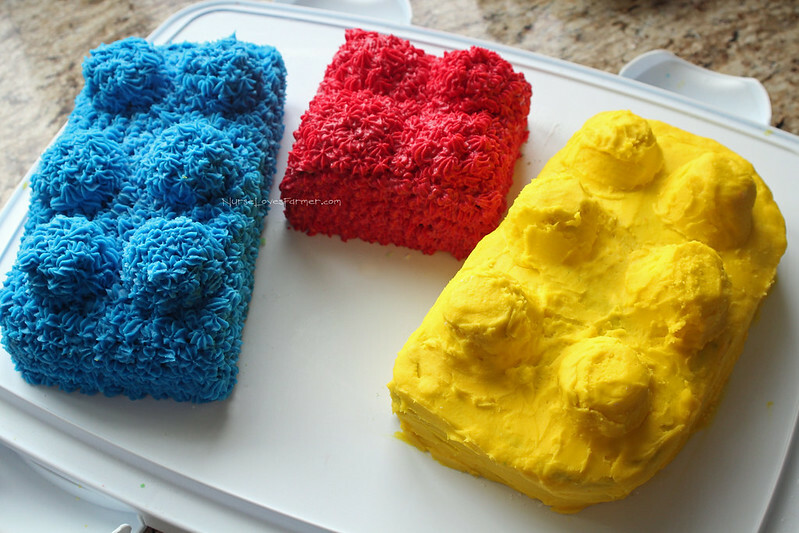 The kids loved the LEGO cakes that I made. All I did was bake a cake in a 13″x9″ pan, cut it into 1/3’s and then I used mini cupcake stumps on top and iced it! Super easy and I also came up with this one all by myself ::pats own back:: I made the red cake smaller as I ran out of icing but I ended up really liking that I had the smaller piece in there! I thought I would entice the children to actually eat the cate by making it a colorful marbled cake…but they still mostly just ate the icing. Sigh. The kids all had a blast and it was an activity they could actually sit and do together! My nephew Nolan who just turned 2 last month REALLY liked the toddler sets and he could play with them and build things very easily. Thank you, LEGO DUPLO for letting us have this awesome party! « Ethan is 3 Months Old! That was the greatest idea ever! I love it! Looks like so much fun!! Great job on the Decor and cake!! We got picked to do a LEGO party but I had to turn it down afterwards due to timing. We are working on the Pull Ups party now!! It was a lot of work but it was so much fun, the kids had a blast! Omg. This looks awesome! I help organize a mom and kids play group in Red Deer and think that this would be so much fun to do as an event. Thank you so much for he great ideas!!! Oh great! I\’m so glad this has inspired you, Rhonda! Wow – looks like you guys had a lot of fun! Our party is tomorrow. I'm doing a cheese and cracker thing too but I sure had trouble finding a small circle cookie cutter (I settled on a tip for an icing bag). That cake looks delicious! You know what those are? I cut up cheese strings! They worked perfectly! Oh – you're clever! I hadn't thought of that! Here I've been using an icing tip and then a kabob stick to poke the cheese circle out of the tip. Ha! That looks like so much fun! I LOVED duplos as a child. Seems like they are making a come back. Will have to get some for my girls. My recent post Daddy Daughter Dance. Any chance you live in Canada? I\’d love to send you some DUPLO coupons! Super cute … now I want cake!